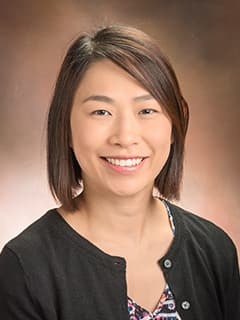 Vi L. Goh, MD, is an attending physician in the Division of Gastroenterology, Hepatology and Nutrition at Children's Hospital of Philadelphia. Goh VL: Eosinophilic Esophagitis: The "Not-So-Rare" Disease. Pediatr Ann 45(2): E63-6, Feb 2016. Vermilyea S, Goh VL: Enteral Feedings in Children: Sorting out tubes, buttons, and formulas. Nutr Clin Prac Nutr Clin Prac 31(1): 59-67, Feb 2016. El-Chammas KI, Rumman N, Goh VL, Quintero D, Goday PS: Rectal Prolapse and Cystic Fibrosis. J Pediatr Gastroenterol Nutr 60(1): 110-112, Jan 2015 Notes: doi: 10.1097/MPG.0000000000000546. Lerner DG, Li BU, Mamula P, Fishman DS, Goh VL, El-Chammas K, Pentiuk SP, Rothbaum R, Gurrum B, Rahhal RM, Goday P, Vitola B : Challenges meeting procedural volume recommendations for pediatric gastroenterology fellows. J Parenter Enteral Nutri 58(1): 27-33, Jan 2014 Notes: doi: 10.1097/MPG.0000000000000184. Rumman N, Sultan M, El-Chammas K, Goh V, Salzman N, Quintero D, Werlin S: Calprotectin in Cystic Fibrosis. BMC Pediatrics 14: 133, 2014 Notes: doi: 10.1186/1471-2431-14-133. Goh VL, Wakeham MK, Mikhailov TA, Goday PS: Obesity does not influence mortality and morbidity in critically ill children. J Parenter Enteral Nutr 37(1): 102-8, Jan 2013 Notes: DOI: https://doi.org/10.1177/0148607112441801. Goh VL, Werlin S: Discovery of Gluten as the Injurious Component in Celiac Disease. Nutr Clin Prac 26(2): 160-2, Apr 2011. Goh VL, Estrada EE, Lerer T, Balarezo F, Sylvester FA: The effect of gluten-free diet on growth and glycemic control in children with type 1 diabetes and asymptomatic celiac disease. J Pediatr Endocrinol Metab 23(11): 1169-73, Nov 2010. Goh VL, El-Chammas KI, Goday PS: Specific Disorders of the Gastrointestinal Tract. Comprehensive Critical Care: Pediatric, 2nd edition. Stockwell JA, Preissig CM (eds.). 2016. Goh VL, Goday PS: Enteric syndromes leading to malnutrition and infections. Nutrition-Infection Interactions and Impact on Human Health, 1st edition. Pammi M, Vallejo J (eds.). Boca Raton, FL, CRC Press, 2014. Goh VL, El-Chammas KI, Goday PS: Specific Disorders of the Gastrointestinal Tract. Comprehensive Critical Care: Pediatric, 1st ed. Stockwell JA, Preissig CM (eds.). Society of Critical Care Medicine, 2012. Goh VL, Biank VF: Other Acquired Liver Diseases - Reye Syndrome. The NASPGHAN Fellows Concise Review of Pediatric Gastroenterology, Hepatology and Nutrition, 1st edition Sondheimer JM, Hurtado CW (eds.). Page: 325-326, 2011. Goh VL, Biank VF: Congenital Hepatic Fibrosis. The NASPGHAN Fellows Concise Review of Pediatric Gastroenterology, Hepatology and Nutrition, 1st edition. Sonddheimer JM, Hurtado CW (eds.). Castle Connolly Graduate Medical Publishing, Ltd, Page: 283-284, 2011. Goh VL, Biank VF: Infectious and Inflammatory Diseases - Granulomatous Hepatitis. The NASPGHAN Fellows Concise Review of Pediatric Gastroenterology, Hepatology and Nutrition, 1st edition. Sondheimer JM, Hurtado CW (eds.). New York, Castle Connolly Graduate Medical Publilshing, Ltd. Page: 279-282, 2011. 2010, Educational grant from American Gastroenterology Association to attend "Inflammatory Bowel Disease mentoring program for GI fellows"